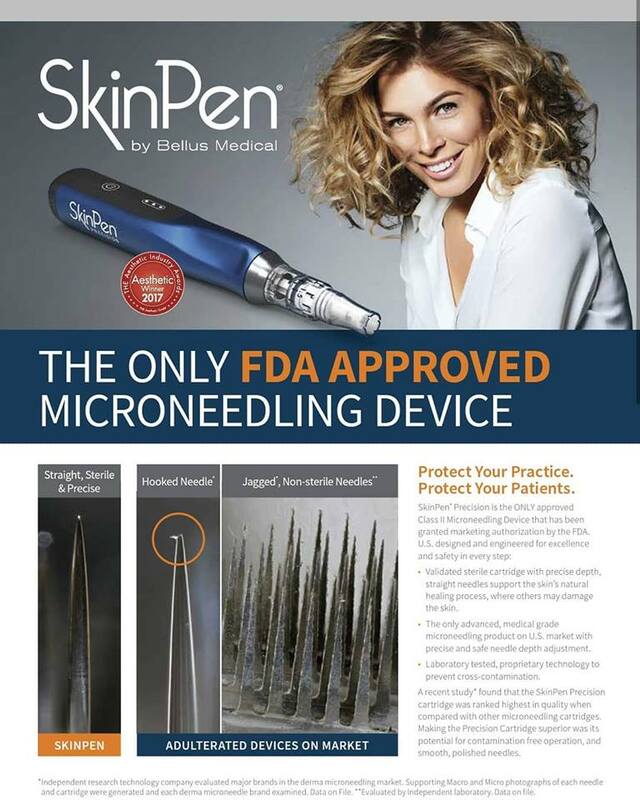 AT E Aesthetics we use the only fda approved microneedling device on the market, the Bellus Medical skinpen! (Also known as Collagen Induction Therapy or CIT) is a new innovation in aesthetic medicine for treating the appearance of fine lines, acne scars and improvement of the skin's overall appearance. During this procedure, the Bellus SkinPen is used to create controlled micro-injuries to the skin in order to naturally produce collagen and elastin. The skin's repair process results in the improvement of the appearance of softer wrinkles, reduced acne scaring, smaller pores, and tighter, firmer skin. Automated microneedling create superficial microchannels into which Biopelle Growth Factors are infused to further improve results. Results with Growth Factors are comparable to those with PRP, but for a fraction of the costs! The SkinPen needling device is used to create controlled micro-injuries to the skin in order to naturally produce collagen and elastin. During microneedling with PRP a small blood sample is taken from your own body and the PRP is separated from the other components. The PRP is then topically applied to the skin immediately following a microneedling procedure. The micro-channels created by microneedling provide direct pathways to the deeper layers of skin for optimal wound healing. PRP releases growth factors into the skin to expedite the body's own repair process and stimulate new collagen and elastin. Microneedling is an ideal treatment for younger looking skin, smoothing out fine lines, wrinkles, and scars. How Is the SkinPen Different From Dermal Needling Rollers? The SkinPen is a medical grade device which moves in a vertical direction for better precision when treating the skin. Microneedling rollers do not create a precise vertical action and the depth is not adjustable. The lack of precision can contribute to greater discomfort and inconsistent effects to the skin. Areas to be treated include face, neck, decollete, arms, hands, legs, abdomen and back. The device can also be used on the scalp to treat hair thinning. The procedure takes 15-30 minutes depending on the size of the area treated after the skin is numbed with a topical agent. What does my downtime look like? Immediately after the treatment, you will notice a bright redness to the skin. The total healing time will depend on the depth of the needles used and the number of overlapping passes. On average patients are red for 2-4 days, but some may heal completely in 24 hours. Make-up may be worn the day after treatment. You will notice an immediate "glow" to your skin while visible changes will develop over the course of several weeks. We recommend most patients to receive a series of 3 treatments spaced about 4 to 6 weeks apart. For deeper wrinkles, advanced photo-aging, stretch marks or acne scars it is recommended to receive 6-8 sessions at 4 to 6 week intervals.